Been quiet on this blog the past few weeks as the crush of one of the world's largest SQLSaturday events arrives. 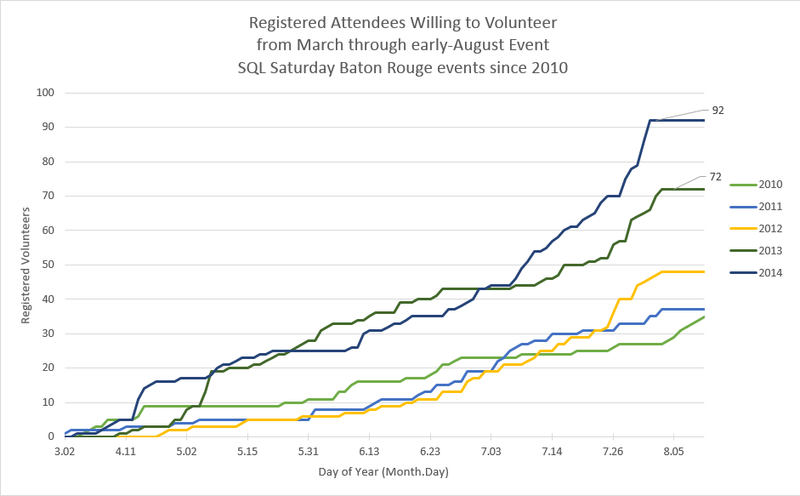 SQLSaturday #324 Baton Rouge this past Saturday was a big success for us and made me very proud of my alma mater (which made attendance mandatory for the entire Masters of Science in Analytics program), my city (except for its traffic), our 2014 sponsors who filled the atrium with booths, and the crew of the Baton Rouge SQL Saturday planning committee, who worked to clean up two full-size trailer loads of garbage. A big public and personal thanks to all of the volunteers and planning committee members who helped this year! We had 614 verified attendees in 2014. This is a great accomplishment for Baton Rouge and a 9.4% increase from last year's actual attendance. Here's our photo album of the event. 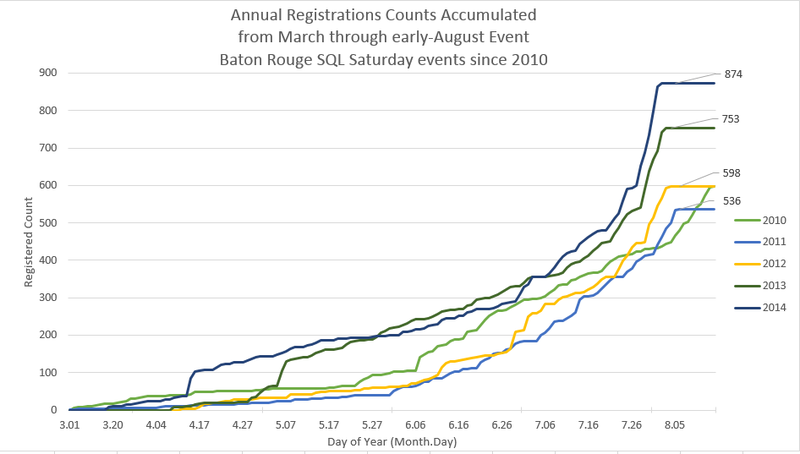 Here's the final numbers on some of the business intelligence we worked up using registration data from the last five years of Baton Rouge SQL Saturday events, which includes all but our first year of the event in Baton Rouge in 2009. Note in the first graph below how we registered 274 attendees in the final workweek of the event, that's 31% of our total registrants and 45% of our actual attendance. Look for the plateaus in the lines - those are weekends. Building on my feelings from last year at this time, I believe that doubling the number of registered attendees one month away from the event is a decent indicator of actual attendance. In this case, roughly 300 registered on July 2 turned into 614 folks through the doors. Registered volunteers this year gratefully rose to meet the occasion. We had new volunteers, older and young, who we'd never met before, hauling garbage out the back door well after the raffle ended. I couldn't thank enough and still feel indebted grateful from my tired feet for helping move and clean. Curious when your folks register? Tuesday is the most popular day for folks to register but Monday at 9AM and Friday at 9AM at the hottest hours of the week. This data has been compiled over 5 years of registration data. Note the impressive spike at 11AM on Saturday morning - prime lawn-cutting time turned into productive stall tactics? Twitter is staggeringly popular among the SQL Saturday speakers - many of which were pulling their hair out as I10E crawled to a halt on Friday afternoon before the much-anticipated banquet at Baton Rouge's best churrascaria. 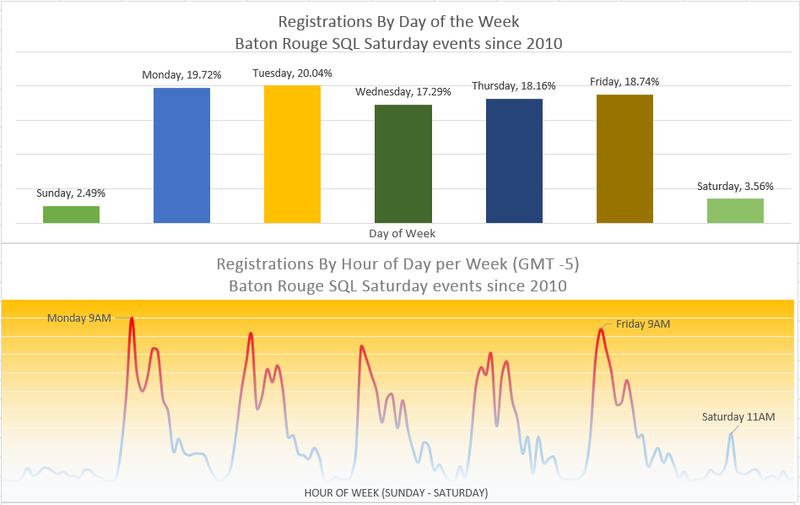 This was the first year that more than a quarter of our attendees registered with their Twitter accounts, and judging by activity on #SQLSatBR it was a popular event. ... but this part I am proud of. As we continue to grow the conference to its (theoretical?) limit, the percentage of locals in our natural gas-boom-bound city is rising, this year overtaking the number of folks from outside the city. That's word of mouth marketing for you. Finally, and this may be related to some of the anonymous feedback we received in our post-event SurveyMonkey, we saw vegetarians make a resurgence in attendance after slipping in each of the past three years. It looked like they were headed for extinction until a big bounceback in 2014. Perhaps this should have prepared us for an anonymous comment excoriating us for the lack of cruelty-free vegetarian lunch alternatives. 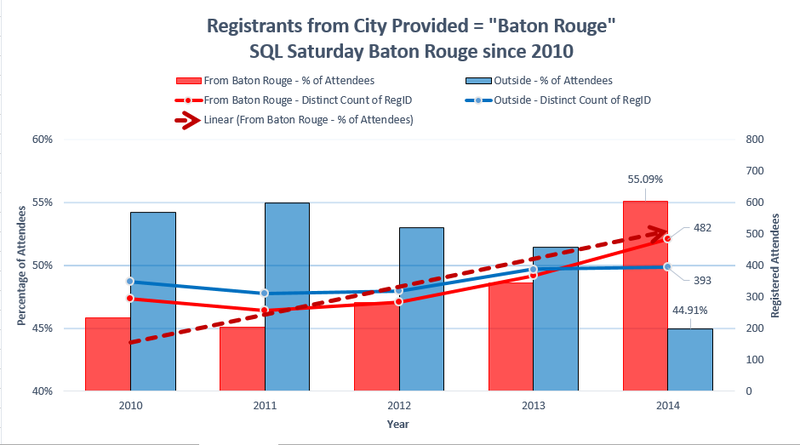 Thanks to everyone who was a part of SQL Saturday Baton Rouge! There is a post-mortem meeting this week for the 2014 event and to begin prep for the 2015 event, if you'd like to get involved, please email sqlpassbr at gmail com.